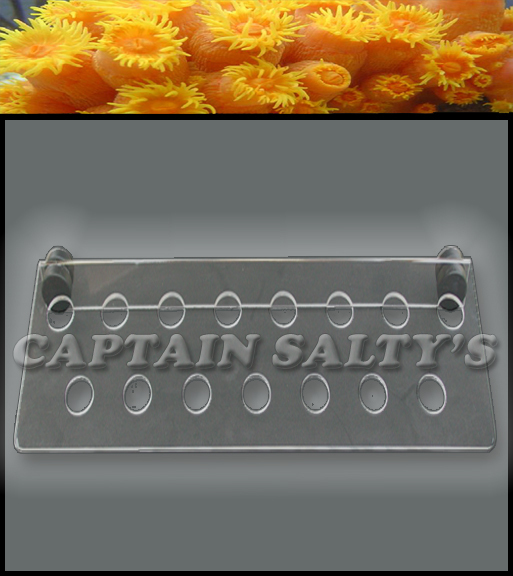 Captain Saltys Original Invisible Large Coral Reef Frag Racks are tested to the extreme and are designed to allow beneficial light to areas where the light may not penetrate when using racks made from other materials. Furthermore, our design has been developed and tested to allow increased water flow to your coral cuttings while they heal from the fragging process. They are easy to clean and because we only use high strength magnets, they will not fall over. In addition to high strength, our magnets have a rust proof barrier that comes straight from the factory. However, because we do not want to take any chances we have added another coating to the magnets to prevent rust. That is not just one rust barrier that is two! In addition, we have applied a coating that not only resists rust but also prevents scratching to the glass or acrylic of your aquarium. Because of the very high strength magnets included on Captain Saltys Original Invisible Large Coral Reef Frag Racks, a few precautions should be considered before handling. · Never pull the magnets off the rack, instead slide them away from the rack in a left or right direction. · Never handle more than one magnet at a time as they may become stuck to each other making it hard to separate them. They may also pinch the user’s fingers if not careful. · Always be aware that they are magnetic and keep them separated by at least one foot, until attaching them to the aquarium. 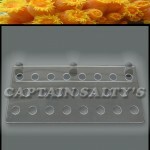 That being said, it is very easy to use Captain Saltys Original Invisible Large Coral Reef Frag Racks. After removing the rack from the packaging, slide off one magnet at a time away from the rack and set it at least 1 foot from the rack and any other magnets being used on the rack. 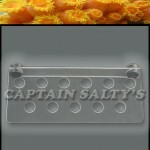 Submerge the frag rack into position inside of the aquarium and hold with one hand. Grasp one magnet firmly and place on the outside of the aquarium while lining up the inside magnet. Repeat this process for the other magnets included. Afterwards it is easy to move rack up and down by using a walking motion on one magnet at a time. Important Information, please read below! We use only high strength and quality magnets for all our Frag racks, Strong enough to hold ALL of our racks, fully loaded, past ½ inch of glass. · Do not place on or near electronics! · Do not allow the Magnets to be handled by people with pacemakers! · Do not allow children to handle Magnets as they may pinch or present a choking hazard!